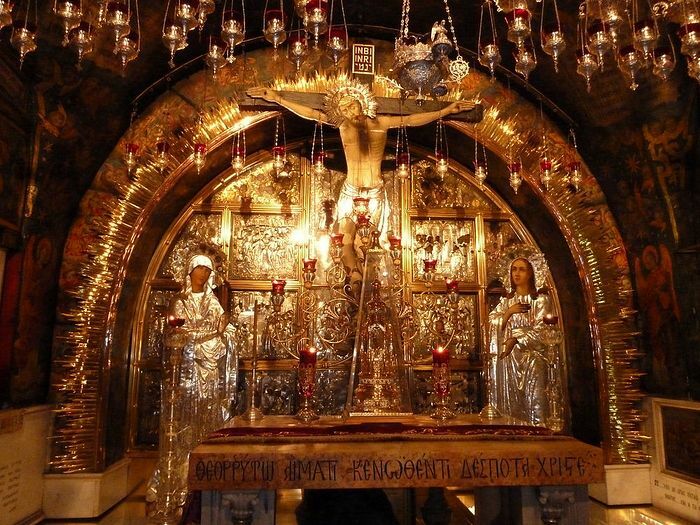 On Holy Friday, after Vespers, they clean the Holy Sepulchre and wash all the lamps that are there; they fill the lamps with pure oil without water and after having put in the wicks, leave them unlighted they affix the seals to the Tomb at the second hour of the night. At the same time they extinguish all the lamps and wax candles in every church in Jerusalem. Upon that same Friday, at the first hour of the day, I, the unworthy, entered the presence of Prince Baldwin, and bowed myself to the ground before him. Seeing me, as I bowed, he bade me, in a friendly manner, come to him, and said, “What dost thou want, Russian abbot?” for he knew me and liked me, being a man of great kindness and humility and not given to pride. I said to him, “My prince and my lord! for the love of God, and out of regard for the Russian princes, allow me to place my lamp on the Holy Sepulchre in the name of the whole Russian country.” Then with peculiar kindness and attention he gave me permission to place my lamp on the Sepulchre of the Lord, and sent one of his chief retainers with me to the custodian of the Resurrection, and to the keeper of the keys of the Holy Sepulchre. The custodian and the keeper of the keys directed me to bring my lamp filled with oil. I thanked them, and hastened, with much joy, to purchase a very large glass lamp; having filled it with pure oil, I carried it to the Holy Sepulchre towards evening, and was conducted to the afore-mentioned keeper, who was alone in the chapel of the Tomb. Opening the sacred portal for me, he ordered me to take off my shoes; and then, having admitted me barefooted to the Holy Sepulchre, with the lamp that I bore, he directed me to place it on the Tomb of the Lord. I placed it, with my sinful hands, on the spot occupied by the sacred feet of our Lord Jesus Christ; the lamp of the Greeks being where the head lay, and that of St. Sabbas and all the monasteries in the position of the breast; for it is the custom of the Greeks and of the Monastery of St. Sabbas to place their lamps there each year. By God’s grace these three lamps kindled on that occasion, but not one of those belonging to the Franks, which hung above, received the light. After having placed my lamp on the Holy Sepulchre, and after having adored and kissed, with penitence and pious tears, the sacred place upon which the body of our Lord Jesus Christ lay, I left the Holy Tomb filled with joy, and retired to my cell. On the morrow, Holy Saturday, at the sixth hour of the day, everyone assembles in front of the Church of the Holy Resurrection; foreigners and natives people from all countries, from Babylon, from Egypt, and from every part of the world, come together on that day in countless numbers; the crowd fills the open space round the church and round the place of the Crucifixion. The crush is terrible, and the turmoil so great that many persons are suffocated in the dense crowd of people who stand, unlighted tapers in hand, waiting for the opening of the church doors. The priests alone are inside the church, and priests and crowd alike wait for the arrival of the Prince and his suite; then, the doors being opened, the people rush in, pushing and jostling each other, and fill the church and the galleries, for the church alone could not contain such a multitude. A large portion of the crowd has to remain outside round Golgotha and the place of the skull, and as far as the spot where the crosses were set up; every place is filled with an innumerable multitude. All the people, within and without the church, cry ceaselessly, “Kyrie Eleison” (Lord, have mercy upon us); and this cry is so loud that the whole building resounds and vibrates with it. The faithful shed torrents of tears; even he who has a heart of stone cannot refrain from weeping; each one, searching the innermost depths of his soul, thinks of his sins, and says secretly to himself, “Will my sins prevent the descent of the Holy Light?” The faithful remain thus weeping with heavy heart; Prince Baldwin himself looks contrite and greatly humbled; torrents of tears stream from his eyes; and his suite stand pensively around him near the high altar, opposite the Tomb. Saturday, about the seventh hour, Prince Baldwin, with his suite, left his house, and, proceeding on foot towards the Sepulchre of our Lord, sent to the hospice of St. Sabbas for the abbot and monks of St. Sabbas; the abbot, followed by the monks, thereupon set out for the Holy Sepulchre, and I, unworthy, went with them. When we reached the Prince we all saluted him; he returned our salute and directed the abbot and me, the lowly one, to walk by his side, whilst the other abbots and the monks went in front, and the suite followed behind. We thus reached the western door of the Church of the Resurrection, but such a dense crowd obstructed the entrance that we could not get in. Prince Baldwin thereupon ordered his soldiers to disperse the crowd and open a way for us; this they did by clearing a lane to the Tomb, and we were able in this manner to pass through the crowd. We reached the eastern door of the Holy Sepulchre of the Lord, and the Prince, who came after us, took his post to the right, near the railing of the high altar, in front of the eastern door of the Tomb; at that spot there is a raised place for the Prince. The Prince ordered the Abbot of St. Sabbas to take up a position beyond the Tomb, with his monks and the orthodox priests; as for me, the lowly one, he directed me to place myself higher up, above the doors of the Holy Sepulchre, in front of the high altar, so that I could see through the doors of the Tomb; these doers, three in number, were sealed up with the royal seal. The Latin priests stood by the high altar. At the eighth hour the Orthodox priests, who were over the Holy Sepulchre, with the clergy, monks, and hermits, commenced chanting the Vespers; and the Latins, by the high altar, began to mumble after their manner. Whilst all were thus singing I kept my place and attentively watched the doors of the Tomb. When they commenced reading the paramia for Holy Saturday during the reading of the first lesson, the bishop, followed by the deacon, left the high altar, and going to the doors of the Tomb, looked through the grille, but, seeing no light, returned. When they commenced reading the sixth lesson of the paramia, the same bishop returned to the door of the Holy Sepulchre, but saw no change. All the people, weeping, then cried out “Kyrie Eleison” which means, “Lord, have mercy upon us!” At the end of the ninth hour, when they commenced chanting the Canticle of the passage (of the Red Sea), “Cantabo Domino,” a small cloud, coming suddenly from the east, rested above the open dome of the church; fine rain fell on the Holy Sepulchre, and wet us and all those who were above the Tomb. It was at this moment that the Holy Light suddenly illuminated the Holy Sepulchre, shining with an awe-aspiring and splendid brightness. The bishop, who was followed by four deacons, then opened the doors of the Tomb, and entered with the taper of Prince Baldwin so as to light it first at the Holy Light; he afterwards returned it to the Prince, who resumed his place, holding, with great joy, the taper in his hands. We lighted our tapers from that of the Prince, and so passed on the flame to everyone in the church. This Holy Light is like no ordinary flame, for it burns in a marvelous way with indescribable brightness, and a ruddy color like that of cinnabar. All the people remain standing with lighted tapers, and repeat in a loud voice with intense joy and eagerness: “Lord, have mercy upon us!” Man can experience no joy like that which every Christian feels at the moment when he sees the Holy Light of God. He who has not taken part in the glory of that day will not believe the record of all that I have seen. It is only wise, believing men who will place complete trust in the truth of this narrative, and who will hear with delight all the details concerning the holy places. He who is faithful in little will also be faithful in much; but to the wicked and incredulous the truth seems always a lie. God and the Holy Sepulchre of our Lord bear witness to my stories and to my humble person; so do my companions from Russia, Novgorod, and Kiev: Iziaslav Ivanovitch, Gorodislav Mikhailovitch, the two Kashkitch, and many others who were there the same day. But to return to my narrative: Directly the light shone in the Holy Sepulchre the chant ceased, and all, crying out “Kyrie Eleison,” moved towards the church with great joy, bearing the lighted tapers in their hands, and protecting them from the wind. Everyone then goes home; and the people after lighting the lamps of the churches with their tapers, remain in them to terminate the Vespers; whilst the priests alone, and without assistance, finish the Vespers in the great Church of the Holy Sepulchre. Carrying the lighted tapers, we returned to our monastery with the abbot and the monks; we finished the Vespers there and then retired to our cells, praising God for having condescended to show us unworthy ones His Divine grace. The morning of Holy Sunday, after having chanted the matins, exchanged kisses with the abbot and monks, and received absolution, we started about the first hour of the day for the Holy Sepulchre; the abbot cross in hand, and all the monks singing the hymn, “Immortal One, Thou hast deigned to go down into the Tomb.” Having entered the Holy Sepulchre, we covered the life-giving tomb of the Lord with kisses and scorching tears; we breathed with ecstasy the perfume which the presence of the Holy Ghost had left; and we gazed in admiration on the lamps which still burned with a bright and marvelous splendor. The custodian and the keeper of the keys told us, and the abbot, that the three lamps [placed below on the Holy Sepulchre] had kindled. The five other lamps suspended above were also burning, but their light was different from that of the three first, and had not that marvelous brightness. We afterwards left the tomb by the west door, and, having proceeded to the high altar, kissed the Orthodox and received absolution. We then, with the abbot and the monks, left the Temple of the Holy Resurrection, and returned to our monastery to rest until it was time for Liturgy. The third day after the Resurrection of our Lord I went, after Liturgy, to the keeper of the keys of the Holy Sepulchre, and said, “I wish to take away my lamp.” He received me kindly, and made me enter the Tomb quite alone. I saw my lamp on the Holy Sepulchre still burning with the flame of that holy light; I prostrated myself before the sacred Tomb, and, with penitence, covered the sacred place where the pure body of our Lord Jesus Christ lay with kisses and tears. I afterwards measured the length, width, and height of the Tomb as it now is a thing which no one can do before witnesses. I gave (the keeper of the keys) of the Tomb of the Lord as much as I could, and offered him, according to my means, a small, poor gift. The keeper of the keys, seeing my love for the Holy Sepulchre, pushed back the slab that covers the part of the sacred Tomb on which Christ’s head lay, and broke off a morsel of the sacred rock; this he gave me as a blessed memorial, begging me at the same time not to say anything about it in Jerusalem. After again kissing the Tomb of the Lord, and greeting the keeper, I took up my lamp, filled with holy oil, and left the Holy Sepulchre full of joy, enriched by the Divine grace, and bearing in my hand a gift from the sacred place, and a token from the Holy Sepulchre of our Lord. I went on my way rejoicing as if I were the bearer of vast wealth, and returned to my cell full of great joy. God and the Holy Sepulchre are witnesses that in these holy places I did not forget the names of the Russian princes, princesses, and their children; of the bishops, abbots, and nobles; or of my spiritual children, and all Christians; I remembered every one, and prayed first for all the princes, and then for my own sins. Thanks be to the goodness of God, who permitted me, unworthy one, to inscribe the names of the Russian princes in the Lavra of St. Sabbas, where they now pray, during the services, for them, their wives, and their children. Here are their names: Michel Sviatopolk, Vassili Vladimir, David Sviatoslavitsch, Michel Oleg Pancrace, Sviatoslavitsch, Gléb of Mensk; I have only preserved those names which I inscribed in the Holy Sepulchre, and in all the holy places, without counting all the other Russian princes and nobles. I celebrated fifty Liturgies for the Russian princes, and all the Christians, and forty Liturgies for the dead. May the blessing of God, of the Holy Sepulchre, and of all the holy places be with those who read this narrative with faith and love; and may they obtain from God the same reward as those who have made the pilgrimage to those holy places. Happy are those who, having seen, believe! Thrice happy are those who have not seen, and yet have believed! By faith Abraham obtained the Promised Land; for, in truth, faith is equal to good works. In the name of God, my brethren and lords, do not blame my ignorance and simplicity; for the sake of the Holy Sepulchre of our Lord do not abuse this narrative. May he who reads it with love receive his reward from Jesus Christ, our Lord and Savior; and may the peace of God be with you all to the end of the world. Amen. From The Pilgrimage of the Russian Abbot Daniel in the Holy Land 1106-1107: A. D. By C. W. Wilson. London, 1888.